All transactions are safe and secure with a reliable history in online purchasing behind each of our associates. Buy the Speed Jump In the Car t-shirt to own Speed Racer clothing and merchandise. These officially licensed Speed Racer t-shirts feature a colorful design that includes Speed jumping into his car on the front. The mysterious masked Racer X is a mystery to Speed, who is always curious of X's true identity, especially since Racer X often helps Speed by sacrificing races to protect Speed from other drivers who try to harm him. Speed teams up with his one-time rival, Rex Racer, to save the family business. See the Racer X costume. 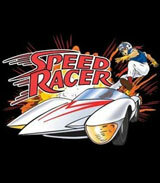 In addition to the Speed Jump In the Car tee above, browse the Speed Racer Clothing Gallery for more apparel like men's and women's clothes, kids shirts or hoodies.